TDP Coordination Committee meeting.At a meeting of the TDP Coordinating Committee meeting held on Wednesday, a discussion on the implementation of the AP and the division guarantees was discussed at a meeting on the latest political developments.The meeting, ministers, party general secretaries and MLAs were present at the head of the TDP Coordination Committee chaired by Chief Minister Chandrababu. Similarly, the Presidents of the District Parties participated in the Video Conference. The Chief Minister said that the party was successful in Tirupati in Tirupati. Congratulations to all the successes of the Tirupati Sabha. The popularity of the TDP in the Tirupati Sabha is a proof of popularity. stepped into tirupathi we feel happy. All major highways from the Air Port are beautiful. Beautifulness in Chalkamatti gave great pleasure. There will be another Twelve Dharmaporata Conference on betrayal and conspiracy politics. Then the House will be held in Visakhapatnam. Satisfaction among the population reached 73% in April, when it was 67% in March. We are satisfied with the fight for our development and rights. There is an advantage over the government and the party has to be very positive. In each constituency, the positivity should increase. You have to move forward unitedly. We must work on a single word, walk in the same way and suggest that we should win in all constituencies. I'm not ready to take your mistakes on myself. Our every action is reaction to people. There is no mistake, no disadvantages should be beneficial to all government schemes. Not in words, but by hand. It should be taken to more people. 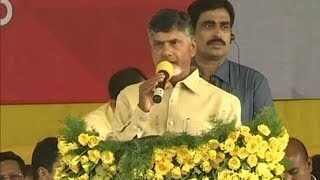 Chandrababu said the satisfaction of doing all these things in four years has never been in the 40s. We are running the polls when there is no money. With the help of farmers we build the capital without money. Our users are efficiently utilized, the preferences have been decided. Convergence is brought. Accountability increased. He said that the juniors are asking for this capital. Chandrababu had once again convinced me about the retired IAS officer IVR Krishna Rao. Those who have the highest positions in our government are writing books. He accused him of malicious hate speech. Do not criticize BJP for not giving status Will you criticize TDP for struggling for status? The question behind this is the secret agenda. Eating attachments in AP is getting relaxed. Mining cases in Karnataka This is BJP's fight against corruption. Right and left, the corrupt people put their message to the people. Karnataka election for Laluachi politics is a case study. He criticized the Swiss bank before taking the election.